As part of the Crowchild Trail Study, noise attenuation and enhanced green spaces along Crowchild Trail were two of the eleven goals used to evaluate concepts. Throughout the study we heard that noise attenuation and visual buffer along Crowchild Trail in bordering communities were important considerations for adjacent residents. 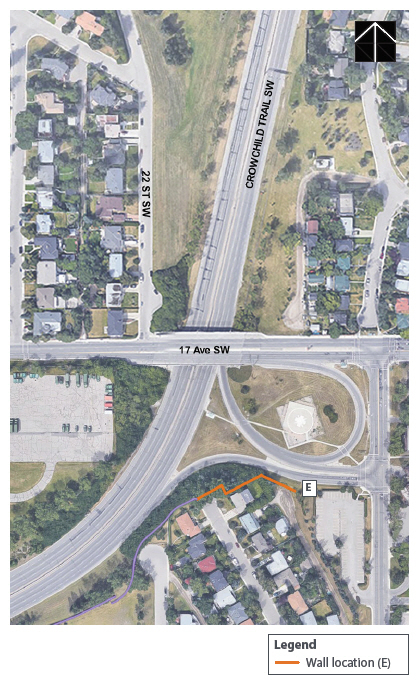 Locations for noise walls and additional landscaping to provide a visual buffer to Crowchild Trail from adjacent residential properties were identified and formed part of the approved short-term recommendations. While there are additional noise attenuation and enhanced landscaping medium-term recommendations that emerged from the Crowchild Trail Study, the focus of this work is the short-term plan only. 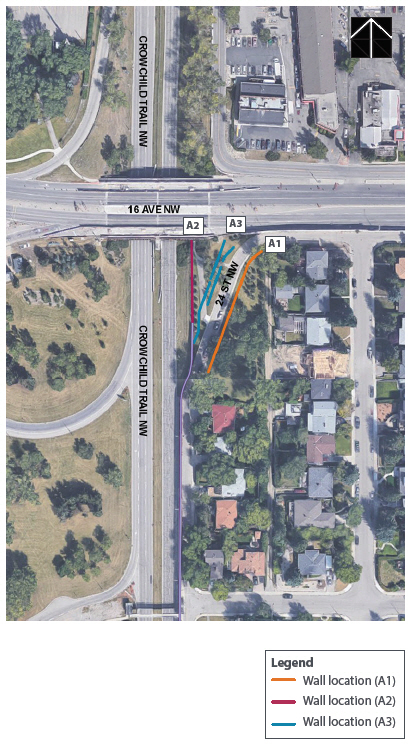 Five locations were identified for additional noise attenuation improvements as part of the Crowchild Trail Upgrades Project (short-term plan). In the analysis of each location, the following noise wall details were considered: location, presence of utilities, constructability, noise wall height, noise wall type, material type, community benefits and impacts. Following the analyses of these considerations, 1-3 options for each location were developed and are being shared with you to gather your feedback and identify preferred options for each of the noise walls. The City’s Surface Transportation Noise Policy sets out conditions for noise wall construction adjacent to residential properties. Crowchild Trail is designated as a truck route with a threshold noise level L10 (peak hour) of 65 decibels, which is equivalent to the sound of a truck 15m away. The L10 value is a measure of the noise level that is exceeded 10% of the time; it is a good measure of frequent noisy occurrences such as steady road traffic. The design of all noise walls, regardless of location, have been set to maintain noise below the target level of 65 decibels L10 peak hour. Noise mitigation is most effective when the wall is located closest to the source (e.g roadway )or closest to the receiver (e.g. adjacent residential properties). When tall enough to break the line of sight between a roadway and the receiver, a noise wall will effectively achieve a 5 decibel noise reduction. Due to the slope down from the houses to Crowchild Trail, locating the noise walls nearer to Crowchild Trail requires that the walls be taller to provide appropriate noise mitigation. If there is landscaping, such as trees, that are taller than the height of the wall, the noise mitigation effectiveness of the wall is decreased. This requires that, in some locations, trees would have to be removed to accommodate construction, but could not be replaced in the same area. Absorptive materials were explored to determine if any additional noise mitigation benefits would be provided using those types of materials. Using absorptive materials is expected to provide <1 decibel decrease in noise levels. Typically, a change in noise levels less than 3 decibels will not be noticeable. In this area, three possible locations for a noise wall were explored. After completing a review of the options, it was found that there was only one feasible option for this location - Wall A2. Constructability: Wall option has fewest conflicts with utility lines compared to other options. Would have the lowest overall construction cost compared to other options. Active Mode Connections: North-south pathway along Crowchild Trail under 16 Avenue N.W. would need to be closed during construction. 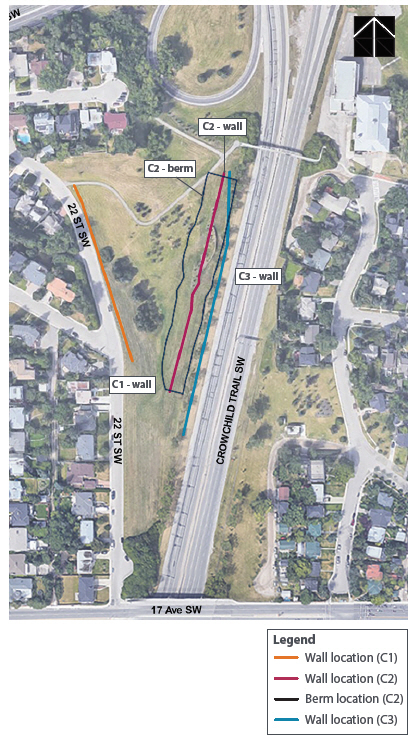 Wall option would block Crowchild Trail traffic, improving experience for pathway users. Green Space: Full functionality of green space as it currently exists would remain after construction. Wall option would improve experience for green space users by blocking Crowchild Trail traffic. Requires removal of trees. Safety: Pathway and park users would be visible from adjacent properties. Use of transparent materials will help improve visibility of pathway users to Crowchild Trail. Constructability: More conflicts with utility lines than other options. Active Mode Connections: North-south pathway along Crowchild Trail under 16 Avenue N.W. would remain open during construction. Green Space: Wall option would reduce access to green space from adjacent properties. Requires removal and trimming cut back of large trees. Wall would block sunlight to park during evening hours. Safety: Wall option would block view of pathway users from park space and adjacent properties. Use of transparent materials would help improve visibility for pathway and green space users. Constructability: Most challenging wall option to construct and would not meet code requirements. Active Mode Connections: Pathway would be closed during construction and would need to be re-built. Not likely able to have same access to pathways following construction than what is available currently. 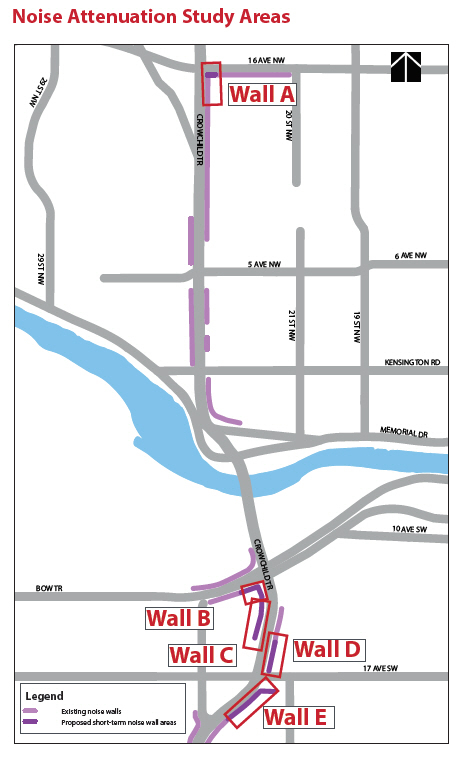 Wall option would block Crowchild Trail traffic, improving experience for pathway users. Green Space: Wall option would bisect the existing green space and potentially limit functionality of the space. Requires removal of trees. Safety: Overlapping wall areas could create areas of concealment. Use of transparent materials would help improve visibility for pathway and green space users. In this area, one possible location for a noise wall was explored. Because the noise wall would have to be constructed on private residential property and would only provide noise mitigation for the impacted properties, the impacted landowners were engaged with directly and we are proceeding according to their preferences. Constructability: Wall option has few conflicts with utility lines. Slope of area makes construction of wall challenging. Active Mode Connections: Pedestrian access to stairway and pathway would likely need to be closed during construction. Green Space: Would be significant tree and vegetation removal to construct wall. 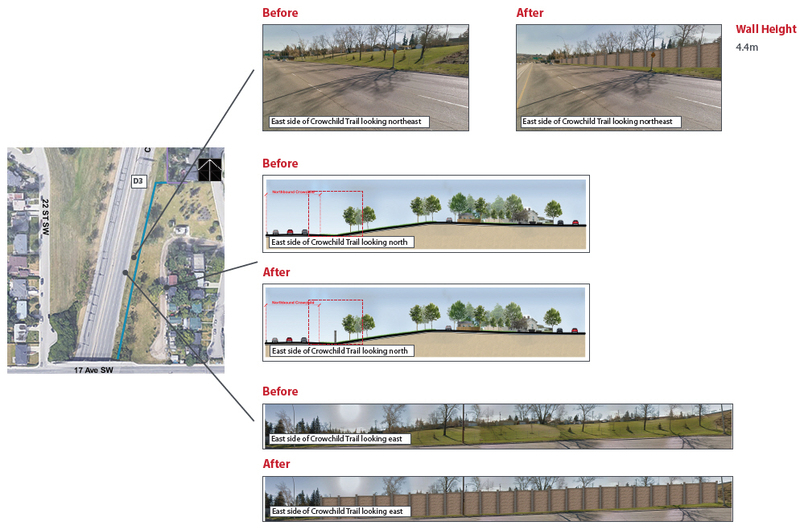 Safety: Wall option would provide separation between Bow Trail ramp and adjacent properties. In this area, three possible locations for a noise wall were explored. After completing a review of the options, it was found that there are two feasible location options for this area and the third one is no longer being considered. 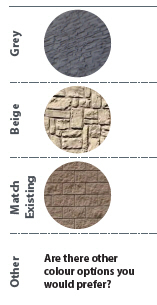 One location option (C2) has two material type options: berm or wall. Constructability: Wall option would have multiple conflicts with utility lines. Existing wall would have to be removed. Active Mode Connections: Would not impact existing formal pathway connections. Would not impact connections to pedestrian bridge at the Sunalta Elementary School. Green Space: Would bisect existing green space potentially limiting functionality of the space and impact existing sledding hill. 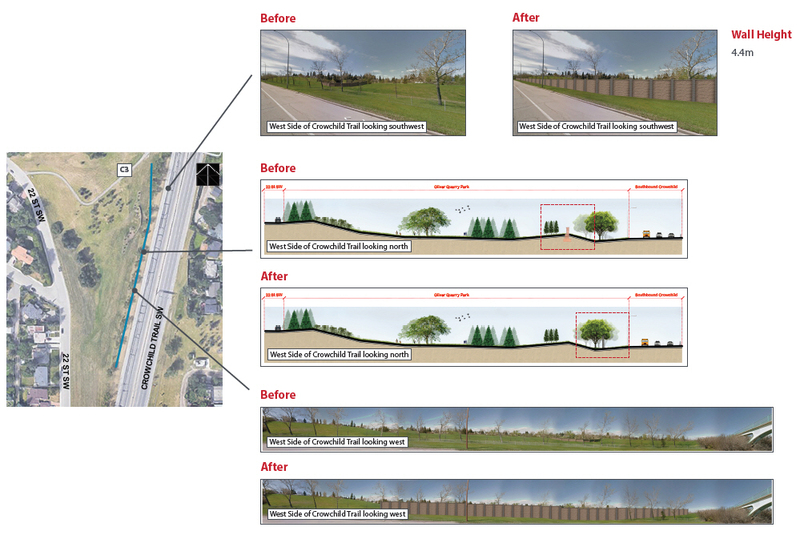 Safety: Wall option would block visibility of green space users to Crowchild Trail. Constructability: Berm option would have multiple conflicts with utility lines. Existing wall would have to be removed. Would have the highest overall construction cost compared to the other options. Green Space: Would provide a more natural feel to the existing green space as compared to a wall. Would bisect green space potentially limiting functionality and impact existing sledding hill. 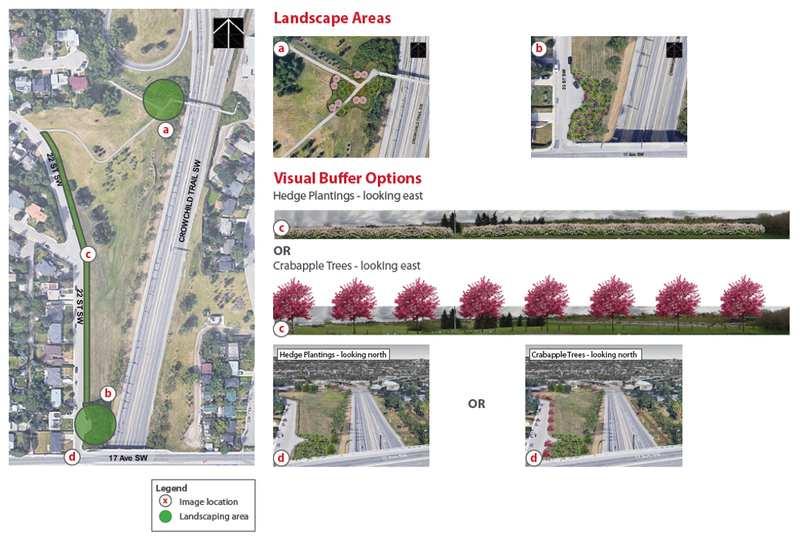 Safety: Berm option would block visibility of green space users to Crowchild Trail. Constructability: Wall option has few conflicts with utility lines. Active Mode Connections: Would not impact existing formal pathway connections. Green Space: Wall option would block Crowchild Trail traffic, improving experience for green space users. Would not bisect green space or impact existing sledding hill. C1 - Why is this option no longer being considered? Green Space: Would block view of green space from adjacent properties on 22 Street S.W. and access to green space from 22 Street S.W. would be limited. Safety: Green space users would not be visible from adjacent properties. 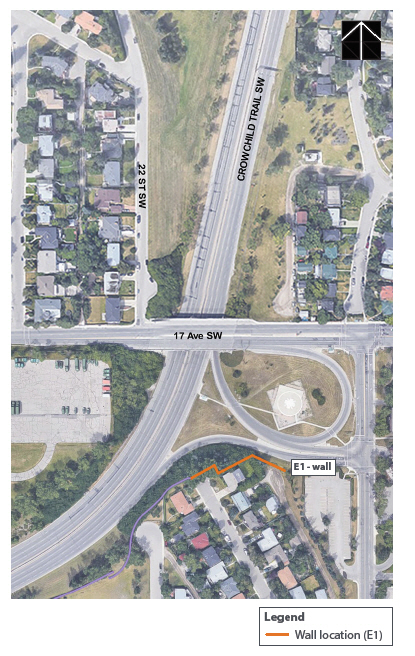 Community Input: We heard throughout the Crowchild Trail Study that a noise wall adjacent to 22 Street S.W. was not a desired location and that other locations should be explored. In this area, three possible locations for a noise wall were explored. After completing a review of the options, it was found that there are two feasible location options for this area and the third one is no longer being considered. Constructability: Wall option would have some conflicts with utility lines. Would have the lowest overall construction cost compared to other options. Green Space: Wall option would bisect and potentially limit functionality of green space. Constructability: Wall option has few conflicts with utility lines. Wall height would have to be between 4.4 to 5.2m to provide appropriate noise mitigation. Green Space: Wall option would block Crowchild Trail traffic, improving experience for green space users. Would not bisect green space or limit functionality. Constructability: Wall option would have the highest conflicts with utility lines which does not allow it to be a feasible option. Active Mode Connections: Wall option would not impact existing formal pathway connections. 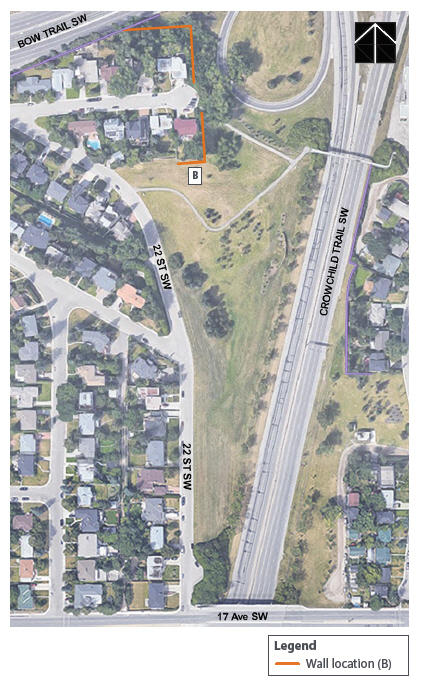 Green Space: Wall option would block access to green space parallel to Crowchild Trail. Safety: Would potentially provide areas of concealment between Crowchild Trail and laneways behind adjacent properties. residential properties was not a desired location and that other locations should be explored. 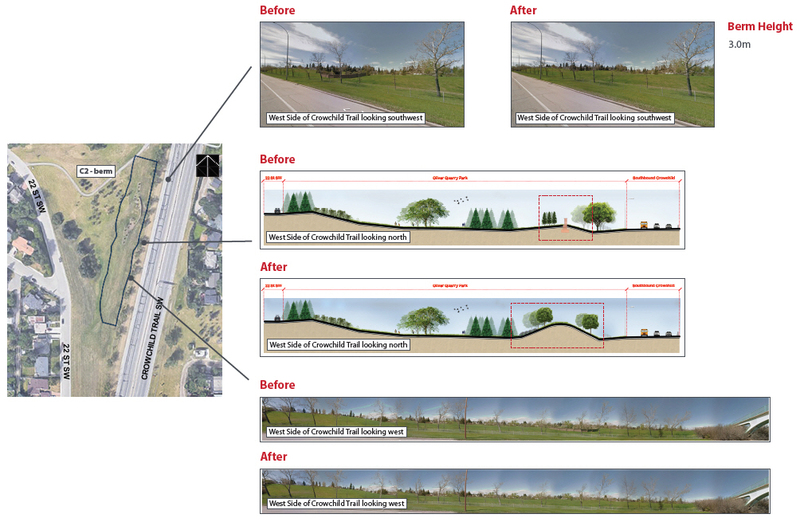 Throughout the Crowchild Trail Study we heard that improving landscaping and providing a visual buffer to Crowchild Trail for residential properties that face the roadway were important. We want to gather your initial feedback on landscape areas, visual buffer options and overall landscape enhancements. Oliver Quarry Park is well-used as a east-west connection between the two communities, an off leash dog park and a sledding hill. Adjacent properties along 22 Street S.W. are front facing which results in The City’s Surface Transportation Noise Policy not applying the same way as adjacent properties on the east side of Crowchild Trail. Additional landscaping and visual buffers emerged from the Crowchild Trail Study as part of the short-term. In this area, there was one possible location for a noise wall. Constructability: Wall option has some conflicts with utility lines. Slope of area makes construction of wall challenging. Would have to be constructed along private residential property lines. Active Mode Connections: Pathway along Crowchild Trail would need to be closed during construction of wall. 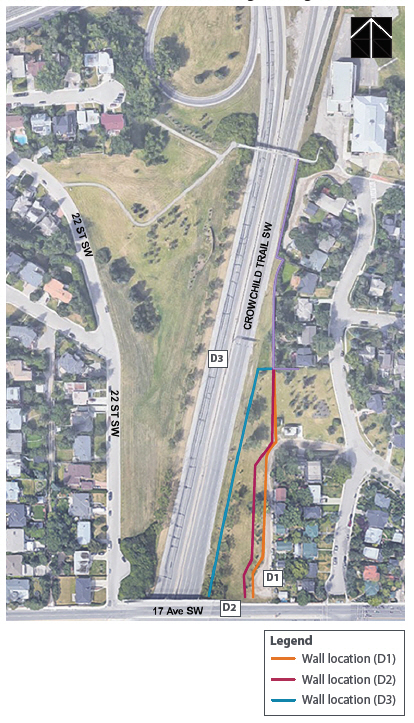 Safety: Wall option would tie into existing wall and provide separation between Crowchild Trail and adjacent properties. Do you prefer this option for Wall C (Option 2 - Berm)? Do you prefer this option (Wall C: Option C2 - Wall)? 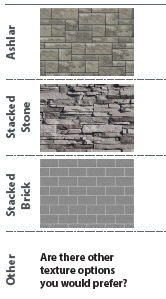 If this wall option (Wall C: Option C2 - Wall) moves forward, my preferred texture is? If this wall option (Wall C: Option C2 - Wall) moves forward, my preferred colour is? Do you prefer this option (Wall C: Option C3)? 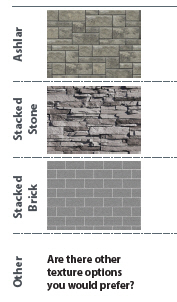 If this wall option (Wall C: Option C3) moves forward, my preferred texture is? If this wall option (Wall C: Option C3) moves forward, my preferred colour is? Do you prefer this option (Wall D: Option D2)? 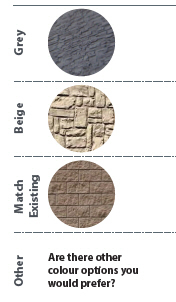 If this wall option (Wall D: Option D2) moves forward, my preferred texture is? If this wall option (Wall D: Option D2) moves forward, my preferred colour is? Do you prefer this option (Wall D: Option D3)? 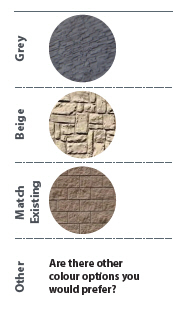 If this wall option (Wall D: Option D3) moves forward, my preferred texture is? If this wall option (Wall D: Option D3) moves forward, my preferred colour is? 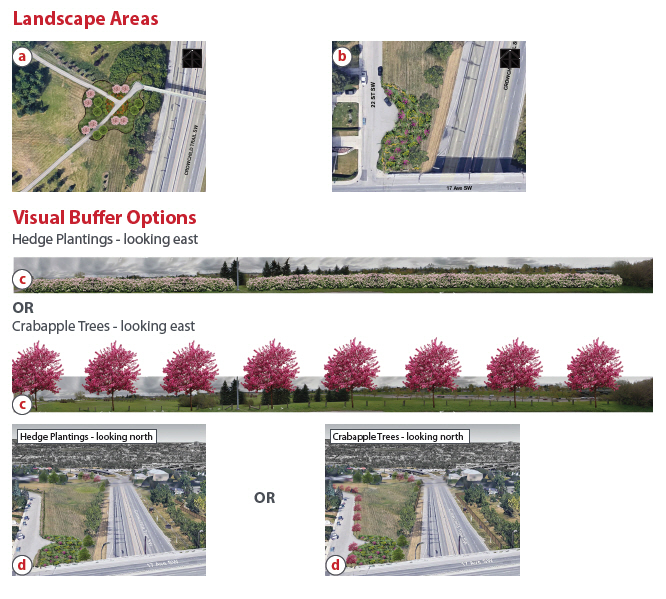 Additional landscaping and visual buffers emerged from the Crowchild Trail Study as part of the short-term recommendations. Do you have any comments about this wall (Wall E) location? 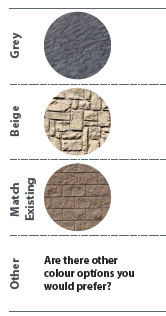 If this wall option (Wall E) moves forward, my preferred texture is? If this wall option (Wall E) moves forward, my preferred colour is? Following the close of the online noise wall engagement, all feedback (received in-person and online) will be reviewed. Then, based on the collected feedback, the project team will finalize which locations, textures, colours, and landscaping The City will be proceeding with for the noise walls identified south of the Bow River. 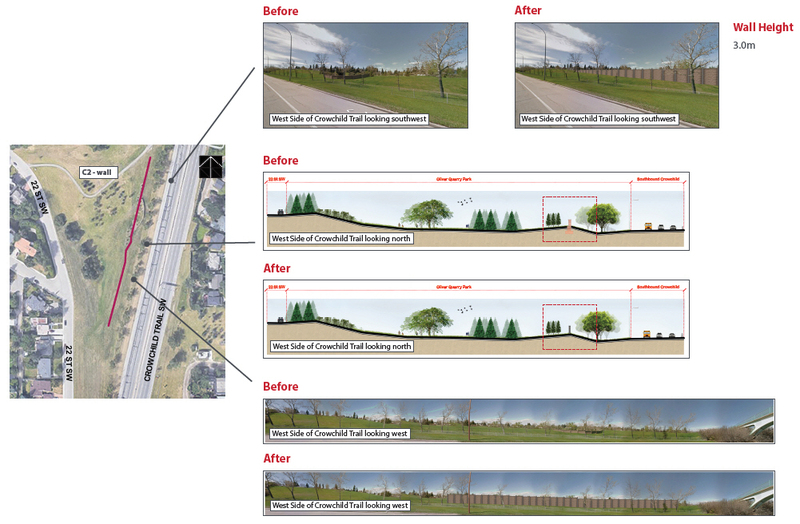 The approved wall locations, textures, colours, and landscaping will be presented at the May 9 information session; at this session you will have a final opportunity to help the project team decide on the finishing touches (i.e. 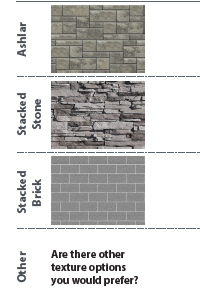 wall accents and associated landscaping) of the noise walls. For regular updates on this project, visit Calgary.ca/crowchild or contact 311.